So we finally got around to doing some stuff to our house. The bathroom was horrible so we took everything out except the bathtub and put all new in with tile. 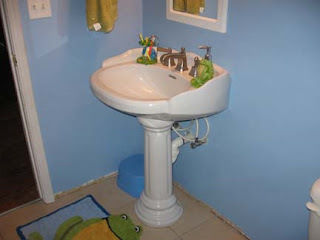 It looks so much better and we have more room since we took out the vanity and put in a pedestal sink. I love the results. 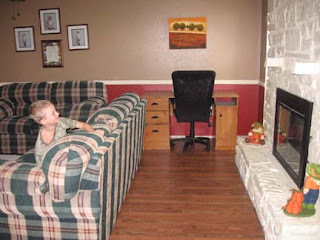 We also put wood laminate in our living room and entry way. It looks so nice and I went and got some new decor. It doesn't even look like the same house. I love it. 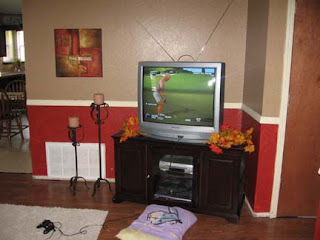 My favorite thing is the TV stand that I got a great deal on. We are so excited we are almost done. We still have to put up the bottom trim but that will come next week. The house looks great! Love the floors! And I also love all the colors on your walls! 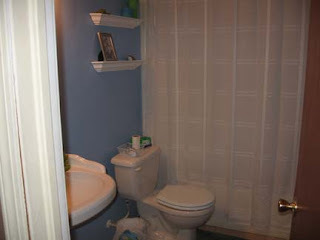 The bathroom looks nice, I can only imagine how cramped it was with a vanity in there! I was starting to wonder about you and where you were! It looks so good! I hardly recognized it! I love the paint in the family room. I always admire red in everyone else's homes but can never pull it off my self. Well done!!! So, the house looks great but it is better to see it in person when you can see it in all its glory! !I am happy that you have been able to get so much accomplished!! And I am glad that I was there to see it all happen and to see you guys!! Love ya! 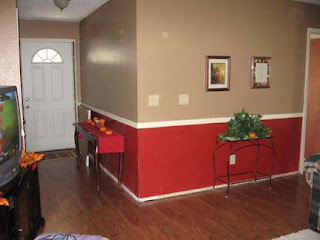 Love the colors on the walls and your floor looks awesome. Great job on the bathroom, I bet it makes a hugh difference.